DC's Bombshells statues continue to roll right along, but at last they're being adapted into a more popular (or at least, "populist") format - action figures! They come in sets of four, with the first series comprising Wonder Woman, Harley Quinn, Poison Ivy, and today's subject, Batwoman. The Bombshells statues were just fun designs, but the comic has given them personalities. Kate Kane was an adventurer. In the '30s she fought in the Spanish Civil War, gaining (and losing) a family in the process. Returning to America in the '40s, she began playing baseball for the Gotham Knights, an all-female team created to keep America's pastime alive while the men were at war. She found this change rather boring, in all honesty, and so began venturing out at night to keep the streets of her city safe. Technically the Bombshells aren't getting their own toyline - it's just a sub-imprint of the "DC Designer Series" dealie, which is the catch-all name for artist-specific sculpts. Since the Bombshells statues were all designed by Ant Lucia, he gets credit for the toys, too. Taking a cue from A League of Their Own (and, y'know, history), Batwoman wears a short black dress with red trim and a wide red belt. She has black shoes, red knee socks, and red gloves. Her black ball cap has been modified with pointy bat ears on either side. Her collar comes down low enough to show off her cleavage, and her swirly skirt certainly doesn't cover very much of her lengthy legs. Batwoman, like all four figures in this first series, was sculpted by Paul Harding, so you know she's going to be lovely. Her hair billows out behind her in a stylish manner, and she has a reserved look on her face. The makeup smeared across her eyes is not just hers, but worn by all the players: the idea is apparently that people are mad about women playing baseball, so they all have to "disguise" themselves? I can't imagine that this does much to conceal her identity, but hey, that's what suspension of disbelief is for. On a similar note, Batwoman's crimefighting outfit is literally just her Gotham Knights team uniform with the addition of a bat symbol on the chest and a different hat. Like, imagine you lived in Chicago in the '90s, and there was a vigilante who was 6'7", fought crime wearing a Bulls jersey, and had his hair dyed all sorts of wild colors; you'd have no trouble deciphering who he really was, would you? Kate even has her number on her back! (Because this is DC, you could probably guess that she was going to be #52.) Like the real Batwoman, her colors are black and red, making her recognizable even at a distance. 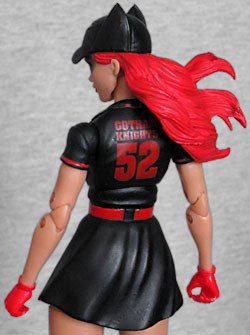 The figure carries a baseball bat with her supranym on the side and a bat logo on the end. You can choose between three different pairs of hands - two fists, two tight gripping, and two wide gripping - or you can replace her left hand with a baseball glove. The glove actually works, too: her final accessory is a baseball, and it hugs nicely in the hollow of her glove, staying in place well, but pulling out easily when you want it to. A nice touch of playability! But then there's the important part: the articulation. Yes, the statues are beautiful, but they're still statues, and this is still an action figure; it needs to move. And DC did not skimp on the articulation! Batwoman has swivel/hinge joints at the ankles, wrists and shoulders; double-hinged elbows and knees; swivel thighs and biceps; and balljointed hips, chest and head. The hips are a unique new arrangement: as mentioned, the legs have balljoints at the top, but there's more than that; the balljoints themselves are mounted on a hinge that passes through the center of the body, allowing the legs to extend down slightly. It's not as if she weren't leggy enough already - the idea seems to be to give the legs just a little extra range of motion, to help with those pin-up poses. So yes, you can get her into the same pose as the statue, but you can get her into other ones, as well, and that's a win. I love the Bombshells designs, but affording the statues was not even in the picture, so I'm glad DC is now turning them into action figures. Yes, their prices are on the high side for toys right now (as they have always been), but you can get an entire series of these for less than one statue. The sculpt is nice and the articulation is fun. Bombshells Batwoman is a quality figure, and I'm probably going all-in on this line.